Although many, if not most of us have been doing it for years, protective styling is being punted as a new phenomenon. 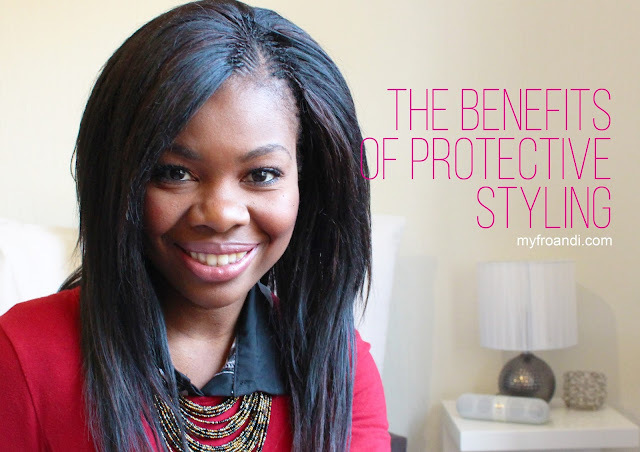 Simply put: protective styling is putting your hair into a style that protects it, especially the weaker and older ends, from the elements and from excess manipulation. Even though I’ve been doing it for years, some of my readers were still shocked that I had a weave put in a couple weeks ago. I often get asked: Why do you put your hair in a weave when it looks nice on its own? Your hair is longer than mine, you don’t need a weave. Well, no I don’t need one but unless you have a genetic or dermatological condition, hair breakage is the main reason for not seeing hair growth. If you’d like to retain your length, a healthy protective styling routine can do wonders to help you reach your goal. Our hair doesn’t respond well to extreme weather conditions. Whether it’s too hot or very cold, the weather and climate of a place can wreak havoc on your hair. Winter is the main reason why I always put my hair away. And this isn’t exclusive to women with natural hair. Even before I went natural, I would rock a weave or braids in the colder months of the year and let my hair out during summer. Excessively cold and hot air dries our hair, which is the most common cause of breakage. By putting your hair away or protecting the ends, you’re protecting it from the harsh elements, therefore helping to retain length. Many of us don’t fare well when we constantly style or manipulate our hair everyday. If you’re like me and like to change it up often, by all means do so. Just know that it’s not the best way to reach a length goal. By putting your hair into a protective style, even if it’s a mini one that lasts a week, you’re lessening the amount of hair breakage that comes from over styling. Less breakage = more length retention. To have healthy, long hair, you need to put in the time. It’s all good and well to have great products but if you’re always rushing to wash, detangle or even set your hair for bed, you’re setting yourself up for disappointment in your journey. For some people, wash day takes them hours but that’s too long for others. Setting your hair for bed doesn’t need to take you ages but if you can’t or you’re not willing to put in the 10/20/30 minutes it takes to prep your hair for the next day and if your hair is like anything like mine, it’ll get tangled and matted. That’s a no-no for healthy hair. When I’ve known that I’ll be having a busy period and I won’t be able to dedicate the time to maintain my own hair, I get a style installed. That way I can go about what’s keeping me so busy with peace of mind because I know it’s safely tucked away. Let’s face it, as women, we like to change things up every once in awhile. And there are many styles we simply can’t do with our own hair. So instead of changing our own hair every two or three months, we can put some extensions in to “fake” it. We’re lucky that our choices are so varied. Tired of your short hair? Get a long weave. Bored of your straight, long hair? Get a funky braided updo. The options are endless, all while not damaging your own hair. If you’re already past the TWA stage and your hair is neck-length, the friction that comes from your hair grazing your clothes, especially scarves etc. can cause it to break. I love my natural hair, but sometimes I need to protect it from itself. That’s why I often do updos of some sort so that my ends aren’t grazing my neck or my snood. The couple of times I’ve had my free fro while wearing a snood, the amount of curlies that were caught in that thing is scary. My protective style of choice? More so than not, I opt for the weave. I love braids and cornrows but the past couple of years, a weave has been my go to choice mainly because of the time it takes to install and to remove. Proceed with Caution: The worst thing you can do when you’ve installed a protective style is forget about your hair. Just because it’s “away” doesn’t mean it’s not there anymore. It still needs maintenance to thrive. So, wash and condition it regularly, and give it a gulp of water often. Also, make sure if you’re using any kind of extensions, that they’re not installed so tightly. I know many of us grew up thinking the tighter the weave or braids the longer the style would last. But this habit is very dangerous as it can lead to traction alopecia (hair loss due to tension). It’s actually not going to prolong your style but rather damage your own hair hence the vicious cycle of putting a weave or wig on to cover the hair loss.